This example considers trending variables, spurious regression, and methods of accommodation in multiple linear regression models. It is the fourth in a series of examples on time series regression, following the presentation in previous examples. Predictors that trend over time are sometimes viewed with suspicion in multiple linear regression (MLR) models. Individually, however, they need not affect ordinary least squares (OLS) estimation. In particular, there is no need to linearize and detrend each predictor. If response values are well-described by a linear combination of the predictors, an MLR model is still applicable, and classical linear model (CLM) assumptions are not violated. If, however, a trending predictor is paired with a trending response, there is the possibility of spurious regression, where t-statistics and overall measures of fit become misleadingly "significant." That is, the statistical significance of relationships in the model do not accurately reflect the causal significance of relationships in the data-generating process (DGP). One way that mutual trends arise in a predictor and a response is when both variables are correlated with a causally prior confounding variable outside of the model. The omitted variable (OV) becomes a part of the innovations process, and the model becomes implicitly restricted, expressing a false relationship that would not exist if the OV were included in the specification. Correlation between the OV and model predictors violates the CLM assumption of strict exogeneity. When a model fails to account for a confounding variable, the result is omitted variable bias, where coefficients of specified predictors over-account for the variation in the response, shifting estimated values away from those in the DGP. Estimates are also inconsistent, since the source of the bias does not disappear with increasing sample size. Violations of strict exogeneity help model predictors track correlated changes in the innovations, producing overoptimistically small confidence intervals on the coefficients and a false sense of goodness of fit. To avoid underspecification, it is tempting to pad out an explanatory model with control variables representing a multitude of economic factors with only tenuous connections to the response. By this method, the likelihood of OV bias would seem to be reduced. However, if irrelevant predictors are included in the model, the variance of coefficient estimates increases, and so does the chance of false inferences about predictor significance. Even if relevant predictors are included, if they do not account for all of the OVs, then the bias and inefficiency of coefficient estimates may increase or decrease, depending, among other things, on correlations between included and excluded variables . This last point is usually lost in textbook treatments of OV bias, which typically compare an underspecified model to a practically unachievable fully-specified model. Without experimental designs for acquiring data, and the ability to use random sampling to minimize the effects of misspecification, econometricians must be very careful about choosing model predictors. The certainty of underspecification and the uncertain logic of control variables makes the role of relevant theory especially important in model specification. Examples in this series on "Predictor Selection" and "Residual Diagnostics" describe the process in terms of cycles of diagnostics and respecification. The goal is to converge to an acceptable set of coefficient estimates, paired with a series of residuals from which all relevant specification information has been distilled. In the case of the credit default model introduced in the example on "Linear Models," confounding variables are certainly possible. The candidate predictors are somewhat ad hoc, rather than the result of any fundamental accounting of the causes of credit default. Moreover, the predictors are proxies, dependent on other series outside of the model. Without further analysis of potentially relevant economic factors, evidence of confounding must be found in an analysis of model residuals. Detrending is a common preprocessing step in econometrics, with different possible goals. Often, economic series are detrended in an attempt to isolate a stationary component amenable to ARMA analysis or spectral techniques. Just as often, series are detrended so that they can be compared on a common scale, as with per capita normalizations to remove the effect of population growth. In regression settings, detrending may be used to minimize spurious correlations. Deleting the point reduces the trend, but does not eliminate it. Alternatively, variable transformations are used to remove trends. This may improve the statistical properties of a regression model, but it complicates analysis and interpretation. Any transformation alters the economic meaning of a variable, favoring the predictive power of a model over explanatory simplicity. The manner of trend-removal depends on the type of trend. One type of trend is produced by a trend-stationary (TS) process, which is the sum of a deterministic trend and a stationary process. TS variables, once identified, are often linearized with a power or log transformation, then detrended by regressing on time. The detrend function, used above, removes the least-squares line from the data. This transformation often has the side effect of regularizing influential observations. Not all trends are TS, however. Difference stationary (DS) processes, also known as integrated or unit root processes, may exhibit stochastic trends, without a TS decomposition. When a DS predictor is paired with a DS response, problems of spurious regression appear . This is true even if the series are generated independently from one another, without any confounding. The problem is complicated by the fact that not all DS series are trending. 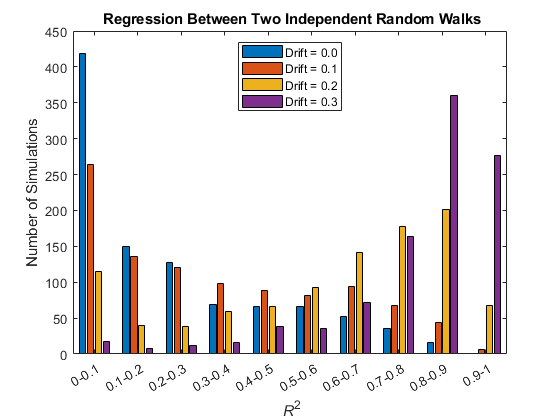 The R2 for the random-walk regressions becomes more significant as the drift coefficient increases. 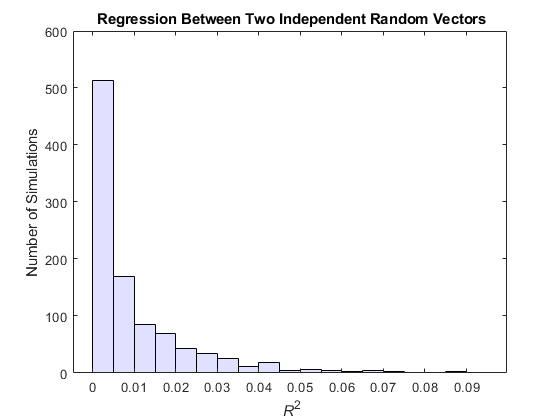 Even with zero drift, random-walk regressions are more significant than regressions between random vectors, where R2 values fall almost exclusively below 0.1. Colors correspond to drift values in the bar plot above. 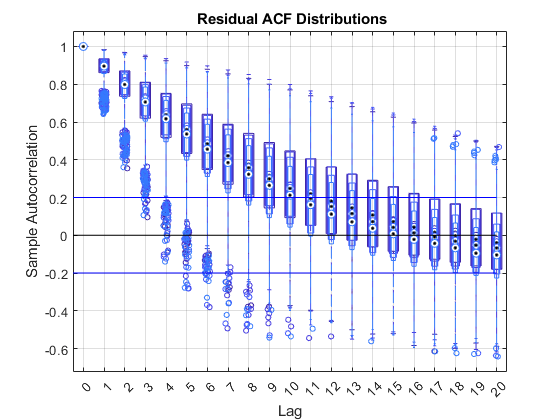 The plot shows extended, significant residual autocorrelation for the majority of simulations. Diagnostics related to residual autocorrelation are discussed further in the example on "Residual Diagnostics." The simulations above lead to the conclusion that, trending or not, all regression variables should be tested for integration. It is then usually advised that DS variables be detrended by differencing, rather than regressing on time, to achieve a stationary mean. The distinction between TS and DS series has been widely studied (for example, in ), particularly the effects of underdifferencing (treating DS series as TS) and overdifferencing (treating TS series as DS). If one trend type is treated as the other, with inappropriate preprocessing to achieve stationarity, regression results become unreliable, and the resulting models generally have poor forecasting ability, regardless of the in-sample fit. The p-values of 0.1 and 0.01 are, respectively, the largest and smallest in the table of critical values used by the right-tailed kpsstest. They are reported when the test statistics are, respectively, very small or very large. Thus the evidence against trend-stationarity is especially weak in the first test, and especially strong in the second test. 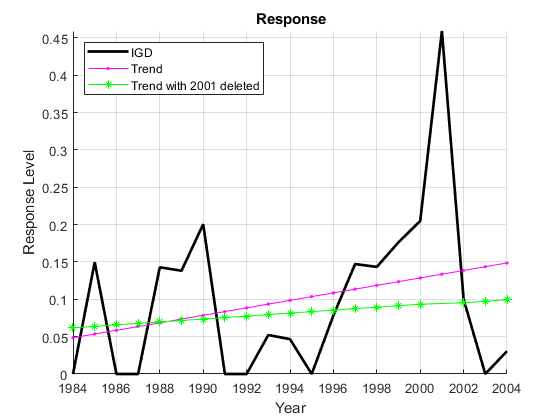 The IGD results are ambiguous, failing to reject trend-stationarity even after the Dickey-Fuller test failed to reject integration. The results for BBB are more consistent, suggesting the predictor is integrated. Columns show test results and p-values against nulls of integration, I(1), and stationarity, I(0). At the given parameter settings, the tests suggest that AGE is stationary (integrated of order 0), and BBB and SPR are integrated but brought to stationarity by a single difference (integrated of order 1). The results are ambiguous for CPF and IGD, but both appear to be stationary after a single difference. The differenced data increases the standard errors on all coefficient estimates, as well as the overall RMSE. This may be the price of correcting a spurious regression. The sign and the size of the coefficient estimate for the undifferenced predictor, AGE, shows little change. Even after differencing, CPF has pronounced significance among the predictors. 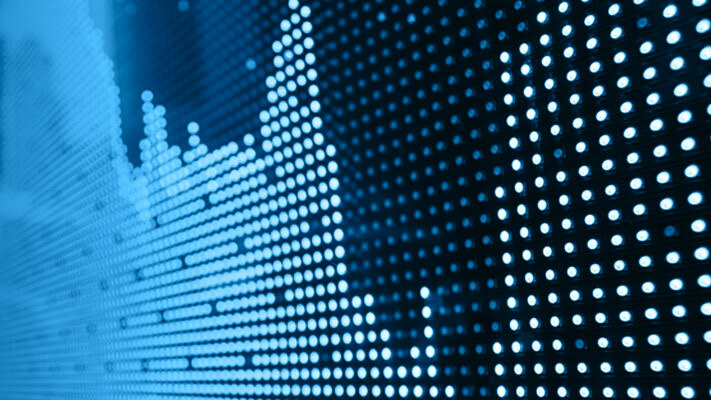 Accepting the revised model depends on practical considerations like explanatory simplicity and forecast performance, evaluated in the example on "Forecasting." Because of the possibility of spurious regression, it is usually advised that variables in time series regressions be detrended, as necessary, to achieve stationarity before estimation. There are trade-offs, however, between working with variables that retain their original economic meaning and transformed variables that improve the statistical characteristics of OLS estimation. The trade-off may be difficult to evaluate, since the degree of "spuriousness" in the original regression cannot be measured directly. The methods discussed in this example will likely improve the forecasting abilities of resulting models, but may do so at the expense of explanatory simplicity. Clarke, K. A. "The Phantom Menace: Omitted Variable Bias in Econometric Research." Conflict Management and Peace Science. Vol. 22, 2005, pp. 341-352. Granger, C., and P. Newbold. (1974). "Spurious Regressions in Econometrics". Journal of Econometrics. Vol. 2, 1974, pp. 111-120. Nelson, C. R., and C. I. Plosser. "Trends Versus Random Walks in Macroeconomic Time Series: Some Evidence and Implications." Journal of Monetary Economics. Vol. 10, 1982, pp. 139-162.